The University Club, designed by architect Henry Hornbostel, is an eight-story building owned by the University of Pittsburgh. Completed in 1923, it is a contributing property to the Schenley Farms National Historic District. The “University Club” began as a private social club in 1890, originally located in downtown Pittsburgh. It later moved to Oakland to be closer to the city’s college campuses, settling into the 1923 Hornbostel classical-style limestone building. 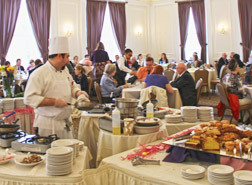 After the club ceased operations in November 2004, the University of Pittsburgh purchased the building for $3.1 million in 2005 for use as a faculty and staff club, conference center, and banquet and event facility. 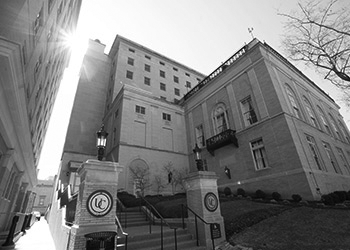 Following the acquisition of the University Club, the University of Pittsburgh conducted a $20.2 million renovation. This renovation incorporated all floors, including housing on the upper floors for families of patients in local hospitals. The building features a grand lobby with a curved staircase, a ballroom with a 600-pound crystal chandelier, tall ceilings, library room, and 10-foot-tall windows with sweeping views of the University campus. Floors 1 through 4 became a 4,000-square-foot faculty club, 4,000-square-foot fitness center, 18,000-square-foot conference and banquet facility, 4,000-square-foot kitchen facility, coffee shop, and 8,000 square feet of offices. The upper floors, five through eight, have 48 guest rooms that are rented to Family House, a local non-profit that helps families of hospital patients with housing. All renovations were completed and the club reopened on April 1, 2009. 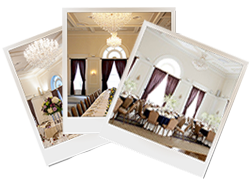 Let us assist you in coordinating your perfect event!